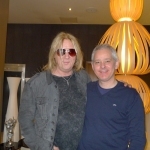 Def Leppard singer Joe Elliott was recently interviewed by Metal Express Radio radio and talked about the 2015 studio album/tour plans. Joe talked about the Down 'n' Outz UK tour, playing little clubs, the difference between Lep/DNO shows, writing original songs for a third studio album, having the side project bands play before Leppard, Vivian's health, Steve Brown, the Summer Tour 2014 with KISS, Phil's guest spot, the 2015 studio album/tour, pulling out of the Black Star Riders album, being a producer, Mutt Lange, the Emm Gryner album, Sheffield, the NFL Wembley show and Christmas/New Year plans. Listen to the full 24 minute interview below - recorded on the 14th December in Newcastle. "We've got - we've got lyrics to write on about four/five (songs). Which I shall be - as soon as I get home I'm gonna be straight back into that mode. We've got about 15 songs going - 7 or 8 of them are written. The other 7 are musically written and need melodies and vocals doing. I will get straight back on that in January." "I don't know it's a good question because - it sounds like Leppard. It sounds like what Leppard should be doing at our age as well. It's a bit more - I don't wanna say mature. That's the worst fkin' word you can say. But it's certainly not a childish record. I mean there's a couple of songs on there that absolutely are typical Leppard anthemic things but there's a lot of cool stuff. Which is a lot more musical if you like and a lot more experimental if you want without being Jazz or anything like that." "I'm gonna go home and help the wife decorate the tree. If she's not already done it. Hang out with the family for a while. Get some writing done if I get a chance. It's always tough around Christmas there's way too much to do until the New Year. But Phil and Sav will be popping over to see me January to start finishing you know all the little bits. We've got backing vocals to do and lyrics to start to do so we'll do - we'll have a little session in January. If we can get this record delivered by the end of March/early April is when the tour's gonna be starting in Canada. And get the album out for Summer time. That'll be the plan." "We've got Europe in May. We've got the UK hopefully I think towards the end of the year. I'm not sure exactly when but let's just say September onwards they'll be a UK tour. And then we'll just take it from there. When you go global you take the phonecalls from Australia, New Zealand and Japan as well as Andy Copping in England and all that lot you know. So it's a global machine and you've gotta go everywhere. You can't be everywhere at the same time so you've got to plan it out." "Well the last I spoke to him he's staying with his brother outside of Los Angeles. Just to get away from the smog so he can build his immune system up because he's had Stem Cell surgery and he's on the mend, is as much as I know."